My name is Tomasz and I have been collecting meteorites for over 18 years. A half individual/shrapnel Sikhote Alin 27g was my first meteorite. As a geologist, PhD, my interest in meteorites range from the beginning of the Solar System to later parent body processes. Over a years I have collected, traded and sold many specimens to individual customers as well as institutions and museums. I am an active member of various meteorite-related organizations including the Polish Meteorite Society – board member, International Meteorite Collectors Association – board member ( # 2321) and The Meteoritical Society. Since 2009 I am also a Managing Editor in the open access journal „Meteorites” – meteorites.pwr.wroc.pl We are first open access journal exclusively about meteorites, if You are looking for more information, visit our web page. I have traveled to many countries to buy meteorites from the finders or to hunt them myself. Finding a „own” meteorite is amazing experience. Most of my finds was or will be classify with providing „in situ” photos, GPS coordinates to every new find. I have personally found many meteorites from the Arabian Peninsula, Sahara and Atacama (Chile) desert and have hunter many other areas as well. Had lucky enough to find Moldavite in Czech Republic. Gallery of „in situ” images or photos form trips and visiting world museum of meteorite collection (Berlin, Vienna) meteorite show’s (Ensisheim 2015, 2016, 2017). Mostly I try to collect all meteorites, all depends on shape, price and provenance (historical falls are one of my most wanted) especially love meteorites form old collections or museums and meteorite books. I also organize lectures to educate people about meteorites (how to recognize, where they come from and how they are formed) and have put together museum exhibition (see photos) to demonstrate the diversity of meteorites. 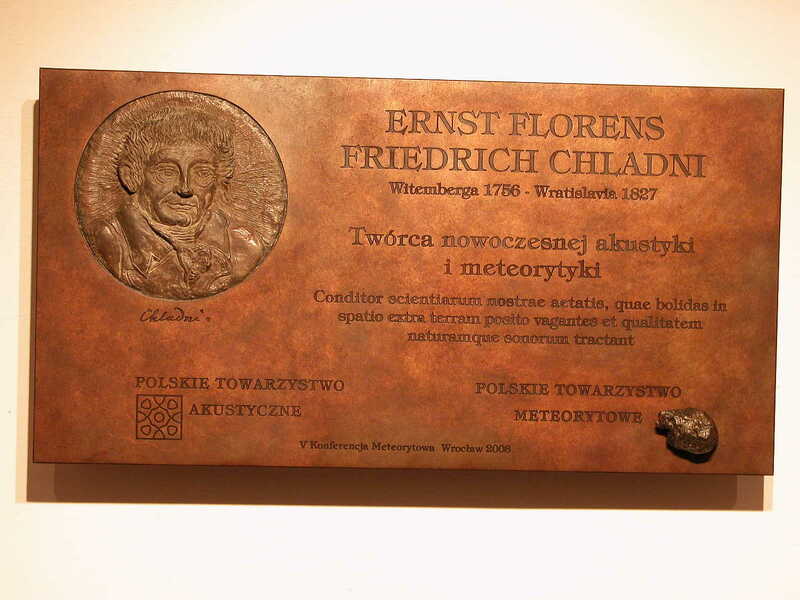 In 2008 during a meteorite conference, together with a friends, we found a memorial plaque to a father of meteoritics Ernst Florens Friedrich Chladni. Table is in Mineralogical Museum, Wroclaw University in Kuznicza street. Wroclaw was the place where Ernst F. F. Chladni pass away in 3 April 1827 during his lecture at local university. His most important work was publish in 1794 a famous „Über den Ursprung der von Pallas gefundenen und anderer ihr ähnlicher Eisenmassen„ (Leipzig/Riga). My scientific research is focused on carbon in meteorites especially in ureilites. Many of my publication can be found on the ResearchGate . Few years ago I defend a PhD at University of Technology in Lodz in Poland. One of my favorites activities associated with meteorites is photography. My present setup consists of a Nikon D750 mainly with Micro 60mm Nikkor lens (see collection page). Visitors can find here around 2000 meteorite related photos. 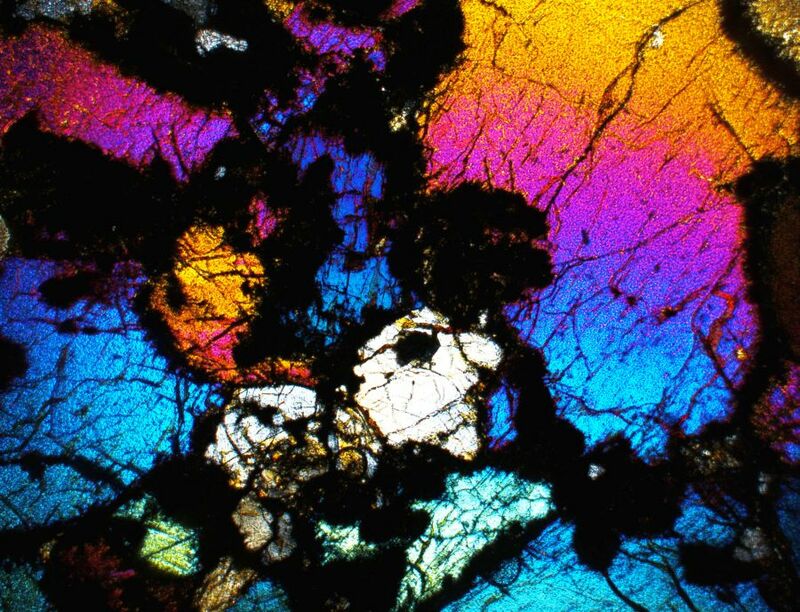 Over a years I make thousands of thin section photos of various meteorites, here couple of them. Most are describe only by meteorite name in free time I will add some more petrography / mineralogical comments. Check also animated gif’s showing amazing polarised microscope effects like interference colors, shock effects vissible on minerals. 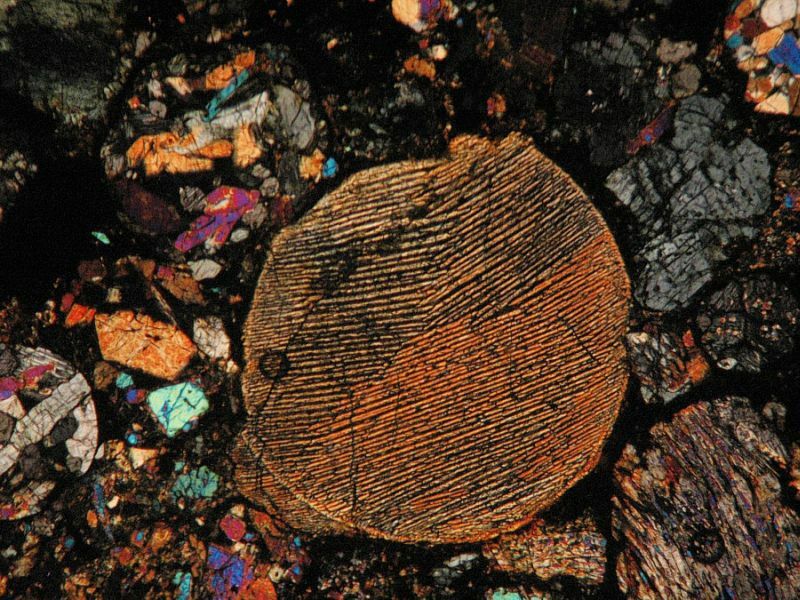 Variety of meteorite types can show galore of textures observed in various types of meteorites form chondrites to achondrites. Part of meteorite collection represent a historical meteorites with museum provenance and old collector labels. I have more than 10 good documented Pultusk historical fall form 31 January 1868. Pultusk is well represented in World collection. Here is some links for more information about meteorites or where they are available also. http://www.woreczko.pl – Polish language meteorite page, with lots of useful information, photos. http://wiki.meteoritica.pl – Dedicated for Polish meteorites and nearby country finds and falls. http://www.littleplanets.fi – amazing web page, Jarkko Kettunen Meteorite Collection, great friend form Helsinki. http://explore-meteorite.com/ – friend page about his collecting and hunting, worth to visit.